Both antigenic drift and antigenic shift are terms used to describe ways in which the flu virus changes over time. A drift is a minor change while a shift is a major one. Antigenic drift is a term used to describe one of the ways that influenza (flu) viruses change and mutate. It describes a minor change in the flu virus. When a flu virus mutates or changes slightly, it looks different to our immune system. So the antibodies that your body created last year in response to the flu virus or the flu vaccine no longer recognize the "new" virus. This is why we can get sick with the flu more than once. The immunity that we have to the flu virus that made us sick last year (or ten years ago, etc.) is basically null and void against the virus that has mutated slightly and now looks like something different. Both influenza A and B viruses undergo antigenic drift. 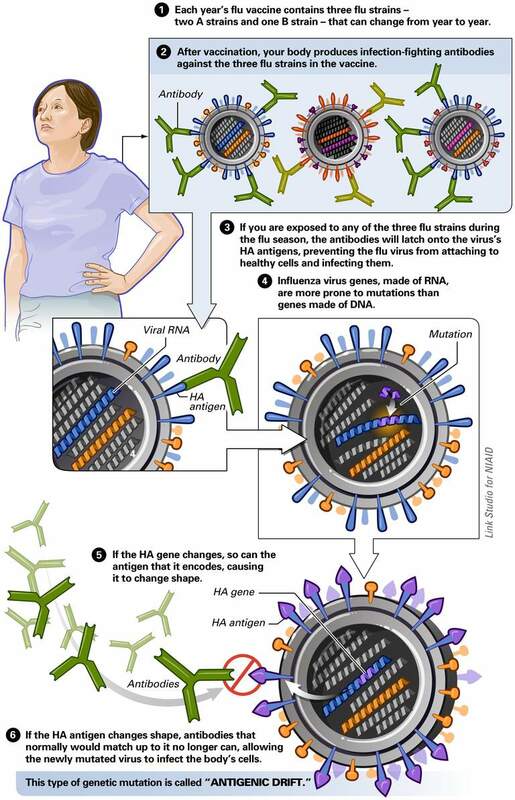 Antigenic shift is a more major change in the influenza virus. This shift occurs typically when a human flu virus crosses with a flu virus that usually affects animals (such as birds or pigs). A human flu virus infects an animal such as a pig. The same pig also gets infected by a flu virus from another animal such as a duck. The two flu viruses can mix and mutate, creating a completely new type of flu virus which can then spread to humans. A strain of bird flu passes to humans without undergoing any type of genetic change. A strain of bird flu passes to another type of animal (such as a pig) and is then passed on to humans without undergoing a genetic change. When a major antigenic shift like this occurs, very few people have any type of immunity to the new, or "novel", flu virus. When flu pandemics have occurred in recent known history, it has been due to an antigenic shift in the virus. Fortunately, these shifts occur only occasionally, having caused only four true flu pandemics in the past century. This major antigenic shift only happens to influenza A viruses. These antigenic drifts and shifts make it difficult to develop flu vaccines and medications that will treat it. Researchers are hoping that they will be able to develop an effective vaccine that will target a part of the virus that is not affected by these changes, leading to a "​Universal Flu Vaccine" that will only be needed occasionally instead of every year. Until that day comes, we will need to continue getting seasonal flu shots and taking everyday precautions to protect ourselves from the flu. How the Flu Virus Can Change: "Shift" and "Drift" Seasonal Influenza (Flu) 8 Feb 11. US Centers for Disease Control and Prevention. Department of Health and Human Services. 14 Oct 13. Antigenic Drift Flu 14 Jan 11. National Institute for Allergy and Infectious Diseases. National Institutes of Health. Department of Health and Human Services. 14 Oct 13. Antigenic Shift Flu (Influenza) 14 Jan 11. National Institute for Allergy and Infectious Diseases. National Institutes of Health. Department of Health and Human Services. 14 Oct 13.